Marvin Kinsey runs on Saturday. Credit: Ron Chenoy, USA TODAY Sports. In terms of the rushing attack, Colorado State’s performance against FCS opponent Illinois State leads me to believe it might be time to abandon the run game altogether. Of course, a team can’t completely eliminate the run and resort to throwing on every down. But, the ship has sunk on the potential to establish the ground game and partially rely on it for four quarters. The Rams accumulated 134 rushing yards on 34 carries during an embarrassing 35-19 defeat to the Redbirds. That amounts to a less-than impressive 4.3 yards per carry. To put it into perspective, Eastern Illinois racked up 195 rushing yards against ISU and averaged 4.6 yards per carry. That may only be slightly better than the Rams, but EIU is an 0-4 FCS program. Considering Eastern Illinois lost the game 48-10, it’s valid to point out that most of their rushing yards were gained during the meaningless portion of the game as well. In addition, EIU was blown out by Arkansas 55-20 earlier this season, the only team CSU has been able to defeat. The Rams came out against ISU and attempted to jam the rushing attack down the Redbirds throats’, a similar strategy used against Arkansas. Senior running back Izzy Matthews was given the ball on each of CSU’s first four offensive plays. One of the plays went for eight yards and another was good for nine. It seemed the running game might actually find success against a defensive front featuring only underclassmen. But, once again, it did not. Matthews’ final stat line doesn’t particularly indicate a poor outing; the senior finished with 71 yards on 14 carries. However, a significant chunk of the tailback’s production came in non-crucial situations when the score was already somewhat out of reach. For example, ISU led 14-6 at halftime and the entire opening half was tightly contested. Within that half, Matthews carried the ball seven times and only amassed 26 yards. After the opening drive, Matthews rushed for 10 yards on three carries in the first half. Statistically, CSU put together its best rushing performance of the season against the Redbirds. But when you think about the opponent, it may actually be the most disgraceful. Well, then again, the Rams averaged 1.7 yards per carry against both Florida and Arkansas and totalled only 40 rushing yards against the Razorbacks. So, it’s a toss-up on worst performance. Regardless, CSU’s running game hasn’t even come close to displaying effectiveness yet this season. Outside of when the Rams play San Jose State (Oct. 6), there won’t be a better opportunity to establish the run than against ISU. If anything, the ISU game indicates that there is a likely chance CSU’s rushing attack will never find a groove this season. One could then ask the question of, “Why?” I mean, Matthews was productive last season and seemed poised to breakout in 2018. Sophomore Rashaad Boddie and junior Marvin Kinsey Jr. bring versatility and toughness to the unit, and Marcus McElroy is a bruiser. 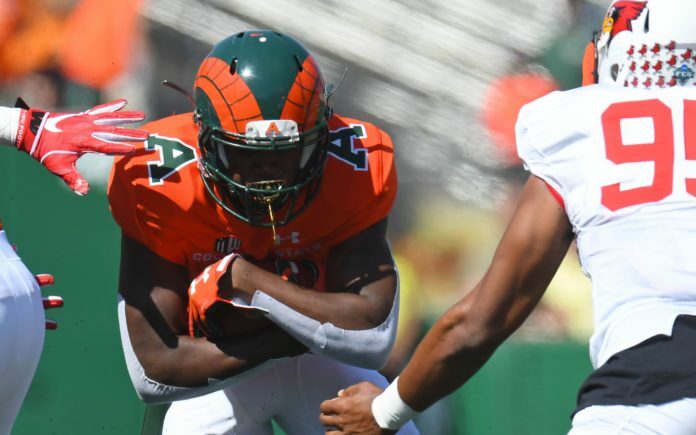 The problem doesn’t lie with the running backs, it can be answered by gazing upon CSU’s offensive line, which has experienced tremendous regression from last season. Yes, there is a bit of an excuse for that. The Rams lost four starters on the offensive line from 2017 including two All-Mountain West linemen in center Jake Bennett and guard Zack Golditch. Nevertheless, it’s not as if seniors Colby Meeks and Tyler Bjorklund had no experience heading into the season, and Jeff Taylor is also someone who was rightfully expected to step up. In fact, they were primed to carry the torch. Stepping up is something none of the Rams’ offensive linemen has done. The unit has looked out of sorts and constantly reacts slowly. A key factor here could be a lack of chemistry for the biggest weakness on the team. The offensive line is far from cohesive, although, there are endless reasons why the offensive line has been horrendous in 2018. Besides an absence of chemistry, the most significant one could be that each individual in the unit is either afraid or incapable of stepping up and being a leader, especially vocally. Bennett naturally led CSU’s offensive line by example. He also instinctively knew how to speak up and rally the troops when necessary. No one on the Rams’ offensive line possesses the ability to orally command, to bring the O-line in line. When it’s clear the line isn’t talented enough to solely lead by example, effective verbal communication is necessary. When one looks between the lines, this isn’t much of a surprise and frankly should have been more of a concern in the offseason. Bobo even had words about the matter during Fall camp concerning different linemen as well. So, if those two weren’t and still aren’t capable of leading the unit, who is? Your guess is as good as mine. Taylor is the only talkative one amongst the group, but, he is currently battling an injury. And even if he was healthy, Taylor isn’t in as ideal of a position to command the line compared to Meeks and Bjorklund considering his level of experience. Until a lineman is able to take matters into his own hands and carry his unit toward positive contributions, CSU’s running game will continue to suffer. If it looks as if none of the Rams’ linemen are going to do so, Bobo might as well call it quits on putting the ball on the ground this season.